TOKYO – In recent years, Japan has fallen prey to a horrific sequence of natural disasters: first an earthquake, then a tsunami, then the nuclear reactor near-meltdown that spawned a real life Godzilla. It was only a matter of time until Hollywood would decide to take the tragic story and use it to tug at the world’s heartstrings. 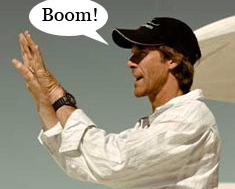 Who better to formulate characters, plot and emotional tension than America’s most beloved filmmaker and Renaissance man, Michael Bay? That’s right: sources indicate that Michael Bay is already hard at work with his latest epic, Japan: The Movie. Early rumors suggested that this project would actually be Bay’s third installment of Bad Boys. In it, Will Smith and Martin Lawrence would reprise their roles in the landmark Academy Award winning series, wherein they would chase drug dealing intergalactic transforming robots to Japan to stop a deal with a major Yakuza gang. Jackie Chan had agreed to play a co-starring role. Unfortunately, Martin Lawrence was already working on another Big Momma’s House sequel, and was unavailable. Will Smith refused to sign on without his “artistic muse,” Lawrence, and so Bad Boys III: Black and Yellow was scrapped. Despite claiming that his film will be full of more chaos and destruction than a Middle Eastern country during election season, the visionary director did leave some space for plot development. He seems particularly excited about a more dramatic and sensitive scene in which Optimus Prime, in a supporting role as a single father of three struggling with radiation-induced testicular problems, declares, “REPRODUCTIVE CAPACITY IS THE RIGHT OF ALL SENTIENT BEINGS,” before blowing a nuclear reactor to dust with a plasma cannon. Prime is already receiving Oscar buzz for his portrayal.